Living together with “others” gives us the opportunity to know ourselves better, to learn about the best in others and to help each other in a reciprocal way. The purpose of intercultural curriculum is to widen our perspectives by learning to see the world through other cultural frameworks and to value other cultures. The intercultural approach differs slightly from a multicultural approach in that while both approaches recognize diversity, in multiculturalism, the diversity of cultures in a society simply co-exist, while in interculturalism, efforts are made to cultivate deep understanding and respect for the variety of cultures in order to create inclusion. 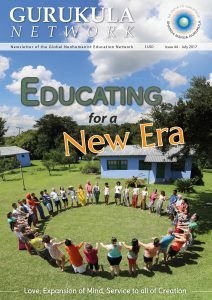 Intercultural education, is in fact, closest to our Neohumanist approach as both are based on respect and understanding. Neohumanism adds the element of grounding that respect and understanding in universal love. Introducing knowledge and acceptance of cultural diversity in the educational environment prepares the children to develop a greater sensitivity and openness to the cultural dimension of their existence. It educates respect towards both oneself and towards others, creating conditions for the development of intercultural social skills, friendship and cooperation. The goal of introducing intercultural education in our kindergarten is to help children to develop the life skills needed for living together in our increasingly diverse, pluralistic modern society. When children and their parents accept the diversity of cultures in our world with interest and curiosity, it leads towards a harmonious acceptance of living together with many cultures. Imbibing the spirit of interculturalism helps to deal with this heterogeneity in a healthy, positive way. Any socio-cultural group in our society can contribute to enriching the overall cultural life of the community through sharing its unique identity through dialogue and interaction. It is thus important to consciously create such opportunities to include all community members, especially those with different cultural backgrounds, in the life of the kindergarten. Indeed, intercultural education is an integral part of our kindergarten’s approach, in order to promote equality, respect for diversity, acceptance, and unconditional love as well as to prevent and fight against all types of discrimination, marginalization and social exclusion. The Neohumanist teacher is a key factor in the children’s internalization of these principles. The teacher, in this context, becomes a learning facilitator or a cultural mediator. The teacher’s task is to create an appropriate educational context and real life situations that stimulate dialogue amongst the children and a diversity of community members as well as encourage the child’s autonomous, critical thinking about stereotypes. It is essential to create positive relationships in interactions between the children and a diversity of guests, as well as to facilitate constructive relationships within the group in order to give them the opportunity to experience their own identities. The Neohumanist teacher must cultivate an intercultural perspective on the personal level as well. It is important for the teacher to cultivate personal experiences of diversity, either intentionally or in casual, spontaneous situations, which can then be drawn upon and applied when working with the children. This often means that teachers must cultivate the courage to go beyond their comfort zones, and to seek to understand people that they might not automatically enter into contact with. In addition, it is of fundamental importance that the teacher is aware of their own culture and to cultivate the ability to perceive the mechanisms of their own biases as well to question the ways these may unconsciously influence their value system. 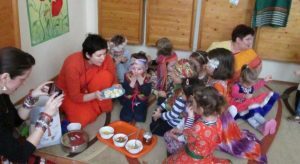 Knowing that kindergarten is a fertile ground for early social learning, the teachers in our kindergarten are aware of various social inclusion projects and programs in the wider society, often led by other NGOs. They actively seek opportunities to connect to such initiatives and create activities that facilitate positive, integrated attitudes. In Rasarit Kindergarten, interculturalism is one of the key educational projects within Neohumanist Education, as the intercultural approach provides an important antidote to racism, exclusion and marginalization. 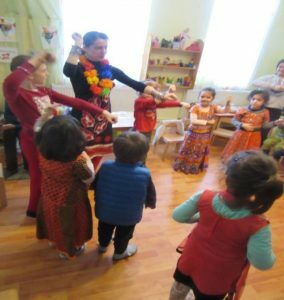 To facilitate intercultural learning, every year teachers in our kindergarten choose a special country or ethnic group as the focus of an intercultural thematic project. The content and themes are carefully selected, to avoid reinforcing stereotypes and the superficiality of a “tourist” approach. Rather, intercultural learning in our kindergarten is based on providing opportunities to develop authentic relationships with real people from that cultural group who can tell us their stories and teach us about their history, attitudes and customs from their own perspective. The educational environment which we offer our children throughout the project provided important information about “who I am” and “how I am”. (These are part of broad thematic questions that guide the Romanian kindergarten curriculum). Accordingly, we made every effort to create an environment rich in possibilities for exploring cultural diversity. We decorated the classrooms with objects made from a variety of materials belonging to Indian culture, listened to Indian music, watched a performance of traditional Indian dance, listened to Indian folklore and stories, and played Indian children’s games. Each day of the week was full of interesting challenges for the children, as well as for the kindergarten team. The journey through the magic of India began on the first day of the week, when we welcomed a special guest, Alexandra, from the Indian Embassy. She helped introduce the children to India as a country, its people, clothing, land, symbols, culture etc., through videos, a slideshow and leaflets. The next day was spent in the company of the family “Bhojwani”. The husband is from India, while his wife is Romanian, and they have two small children that also attend a nearby kindergarten. They told the children about the beauty of India, showing them pictures from a trip they made with the whole family to Rajasthan, dressed in traditional clothing. They brought many special, Indian things to show to the children. 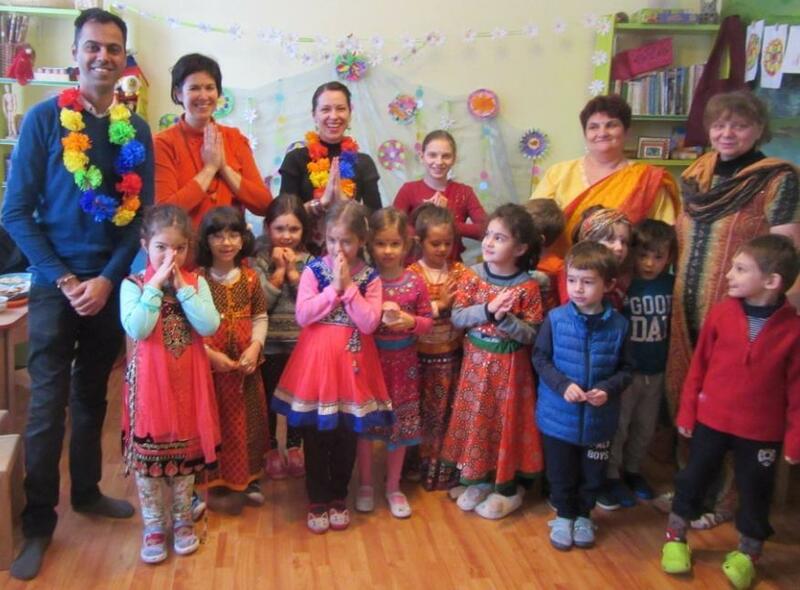 The children had the opportunity to dress up in traditional Indian costumes, try on bangles, dance to Indian music and taste the spicy and exotic flavors of Indian food. They ate papadam, pakoras, chana-chur snacks and Indian sweets. The children were even involved in both making and tasting delicious, creamy mango lassis! They also decorated the classroom floor with brightly colored “rangoli” sand artwork. In the last day of the week we learned about a beautiful Indian classical dance with the guidance of a lovely dancer of Indian classical dance, Iuliana. She performed several pieces and then explained the meaning of different “mudras” or symbolic gestures used in the dance. The children also had the chance to imitate the gestures together with her. Music, dance, stories, crafts and art are effective ways to introduce children to the secrets of another culture. Creating an environment full of opportunities to explore diversity encourages children in developing their ideas about themselves, and about others. It creates conditions in which children can initiate conversations about perceived differences, which offers adults the opportunity to offer positive, supportive and clarifying information about diversity. Our teachers give special attention to educating children in self respect, respect towards others and acceptance of different opinions. Acceptance means understand and appreciate the way of life of those around us. Our children are taught to accept individual differences, no matter how unusual they are, because everyone has a unique personal value. The work of the teachers in our kindergarten isn’t limited only to educating the children, but continues as well amongst the parents. Here in Romania society, exposure to interculturalism is a relatively recent, progressive phenomenon. Although different ethnicities have long been present in the society, they mostly co-existed together with mutual tolerance rather than developing understanding, unity and inclusion. We must explain to parents the value of this approach, by highlighting the fact that kindergarten is guided by principles of equality and inclusion and we strongly believe that embracing differences is valuable, enriching and compliments our growth as human beings. Since our society is becoming more and more complex, as borders disappear and the explosion in the circulation of information, ideas and people becomes an unavoidable facet of modern life, we must teach children how to live within this multiplicity of cultures. We need a social education that teaches how to accept, appreciate and value differences, and Neohumanism gives us the responsibility, insights and tools to bring this into early childhood education.